Inspiring students’ need to know with a microscopic, absent-minded doctor lost in a patient’s body who needs help with the diagnosis. For 12 weeks, sixth graders in my class embark on a learning adventure based on the misadventures of a fictional character called Dr. Smallz. The class is a hands-on, inquiry-based, integrated science and math course. 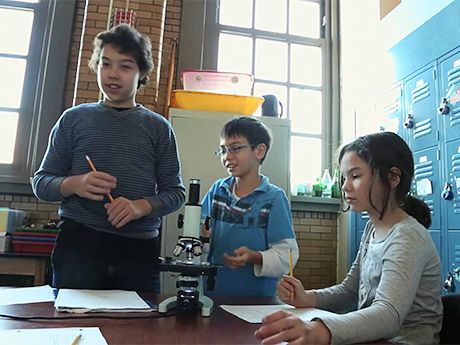 Students get a chance to be scientists, designers, makers, and players as they learn all about human body systems, cellular functions, and the ability of the human organism to maintain dynamic equilibrium. The Dr. Smallz Mission is a great example of the type of game-like learning experience that creates a powerful need to know in students, leaving them hungry to learn more. Who is Dr. Smallz? My students will describe him as if he’s an old friend. He’s a clumsy, disorganized, well-intentioned medical doctor who decides to diagnose a patient’s mystery disease by taking a closer look inside the body. Without the knowledge of his bosses at Shrinkley Labs, he puts himself in their newly developed shrinking machine (which has not yet been tested on humans), boards a microscopic ship designed to withstand the tough interior conditions of the human body, and rides the air current of an inhalation to get inside his patient’s respiratory system. Unfortunately, during the shrinking process, his brain gets a little bit jumbled up, and he experiences amnesia specific to all of his medical vocabulary. He finds my class through an internet search, and is sure that we’ll be able to assist him. The adventure starts with a micro-postcard. I begin the trimester teaching my students how to use microscopes, and when they receive samples to analyze, they’re under the impression that they will be looking at a few plant cell samples. But when they switch their microscopes on, they find an encoded message—letters and numbers that they decode to find a website address. When I go to that URL and project Dr. Smallz’s first message to the students on my SmartBoard, you can hear a pin drop in the classroom. Jaws are hanging open, and eyes are bright with wonder and amazement. Students in Leah Hirsch's classroom work on a mission. What body system is this a part of? What do we already know about this body system? What do we need to learn in order to help Dr. Smallz navigate around this body system? What systems connect to it, and where else in the body could he travel to? From this point on, students are hooked. The doctor’s messages provide clues about the mystery illness his patient is suffering from. In the end, students use the clues to diagnose the patient with dengue fever, advise Dr. Smallz on the best treatment, and find him the safest route out of her body. (They usually decide to take him through her ear.) While my students give Dr. Smallz advice and information on the body, I embed assessment into the narrative, asking them to create films, posters, travel guides, emails, etc. Students learn about the body by “leveling up”—as they become experts in one body system, they are able to unlock the doctor’s safe passage into the next body system. As the narrative progresses, Dr. Smallz’s movements and decisions become increasingly influenced by the advice from my students, allowing them to chart the course of their own learning and serve as mission control for Dr. Smallz’s journey. The students are immersed in what they’re learning because they develop a sense of empathy for both Dr. Smallz and his patient. The Dr. Smallz Mission is a multilayered narrative, but the need to know is simple—my students want to learn about the body systems because they want to help this character, and it’s fun for them to feel as though they have a hand in shaping the course of the doctor’s travels within the body. Creating meaningful need to knows not only allows me to engage hard-to-reach learners but also pushes the limits of my creativity in the classroom and keeps me engaged as well. Start with your standards. Plan backward. Pick out your Common Core standards as well as your content standards, and determine what you want your students to do and how they will be able to show it. Craft essential questions and enduring understandings to frame your mission. What kind of inquiry will your students engage in, and what will they remember years after leaving your classroom? Brainstorm authentic contexts for problem-solving around these essential questions. These could involve a cast of characters, an adventure, or a game that the students play. A good place to start a brainstorm is with a real-life job that uses the content and skills you want to teach. Craft a story around that job. Use your narrative to determine what hats the students will be wearing—what role they’ll play in the narrative: detective, designer, researcher, etc. Add additional narrative details that will immerse students in these roles. Develop a series of learning experiences and assessments that move toward your final goal in a coherent and concrete way.